Well, we skipped a generation on the front page, because overclocking Sandy Bridge and Ivy Bridge were both relatively similar, and we had this excellent thread on the forum by theocnoob. 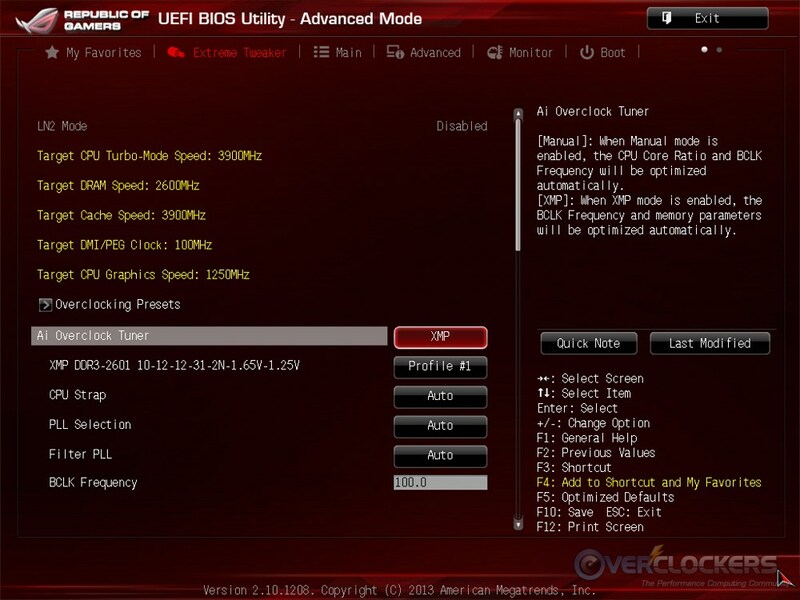 The overclocking game, however, is in for a bit of a facelift with Haswell. What if I were to tell you all this super high speed RAM people purchased for Ivy was no longer necessary and/or it can’t be used with Haswell? What if I were to tell you there were people in the industry that think Haswell is going to be so difficult to cool that 24/7 single stage phase change cooling will be more appealing again? Think you could use a guide then? We thought so. First up though, I have a confession to make. The “3 step” part of the title is not the whole story. There are going to be three steps, but it’ll be more like three categories, with sub-steps. The first thing you need to know about Haswell you already found out in our review (read it here if you haven’t already) – it runs hot. You will need a lot more than the stock cooler if you want to overclock. With a very good air cooler or all-in-one water cooler, you’re looking at a heat limited voltage cap of about 1.25 V. At that voltage with air or AIO cooling, you’ll be seeing temperatures in the upper 80’s to lower 90’s (°C) range under normal full processor load. The easiest way to see how far your particular chip will go is to set the voltage manually at 1.25 V, set all cores to run the same multiplier, then start raising that multiplier until you run into instability. A good stress test that stresses more than one instruction set (such as Prime95) is the stability test in AIDA 64 (download that here). However, you should know that will make your CPU run hotter than any normal load you can put on it. It is designed to throw every instruction set at the CPU at once to make sure it can handle the load. In every other scenario, even 24/7 loading programs like Folding@Home or SETI@Home won’t heat it up quite that far; though those will be closer to the AIDA64 temperatures then normal usage scenario like gaming or workstation use. Ideally, you will be able to keep normal usage temperatures under 90° C, just to be safe. Going over that won’t kill the chip, but it won’t do it any favors either. Once over 90~95° C, the chip will begin throttling to reduce temperatures and that will make your overclock pretty useless rather quickly. 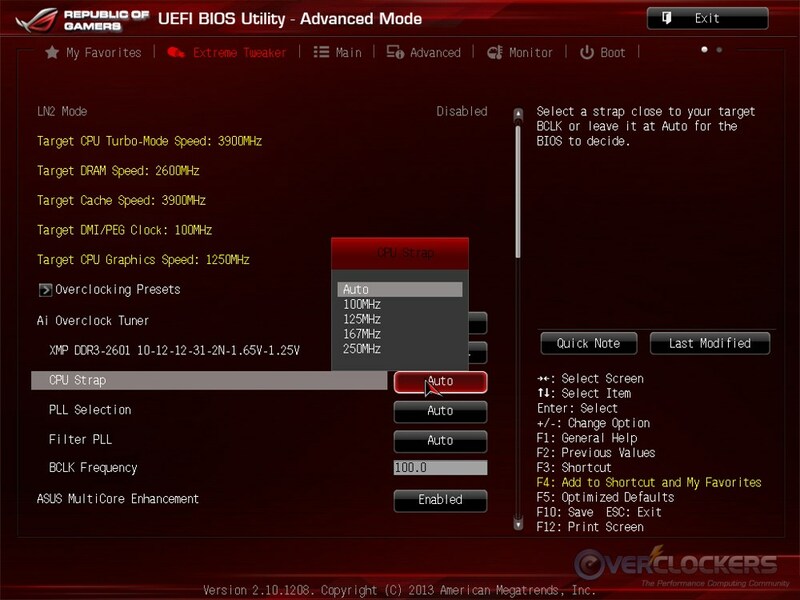 Now, I’ll share a secret imparted by the folks at ASUS who gave several reviewers some tips on overclocking the retail stepping Haswell chips: Set Vcore to 1.20 V. Set all cores to 46x (which would be a 4.6 GHz overclock), save & reboot. 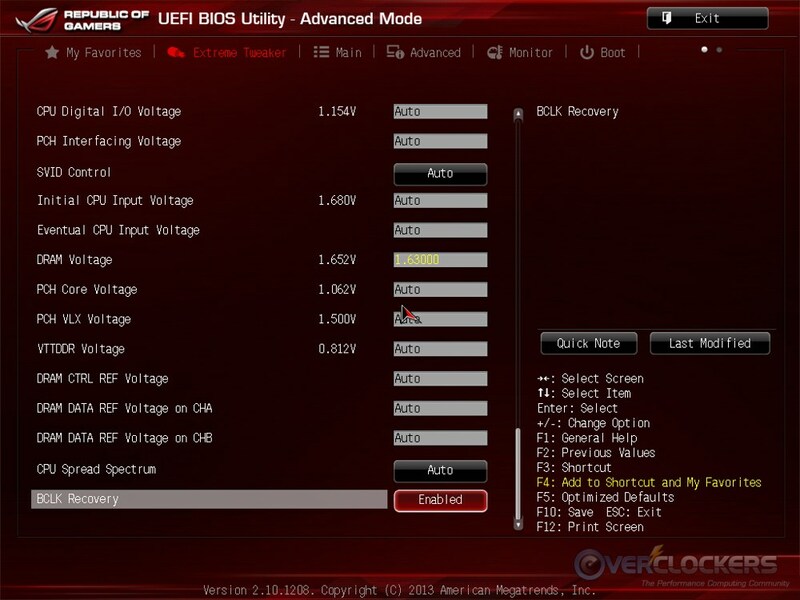 If the system boots past the UEFI and either begins to load or, ideally, makes it into the OS and is stable, you have a 50th percentile or greater chip on the Haswell overclocking-ability bell curve. 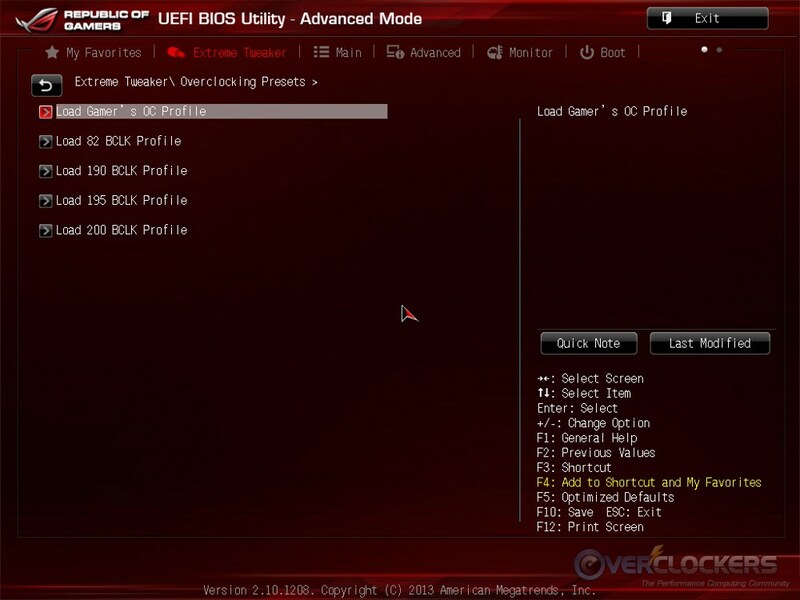 If it won’t at least boot there and make it into the UEFI, you probably have less than a 50th percentile chip. You can expect chips in the lower 50th percentile to top out in the 4.4-4.5 GHz range at 1.25 V.
If your chip will boot at 4.6 GHz and 1.25 V, that’s very good. It means you have at least an average chip. If it will boot at 4.6 GHz and is stable there, then you may have an above average chip. The best chips will be able to do 4.8 GHz stable at 1.25 V. Our sample did 4.8 GHz, but at 1.3 V and on a custom water loop. Using 1.3 V will likely put a chip out of the air cooling / AIO water cooling thermal envelope. Temperatures in all of these scenarios, from the dog 4.3 GHz chips up to the good 4.8 GHz chips, will always be in the ~90°C range. That’s just the nature of Haswell. With the VRM on-die, think of Haswell as Ivy Bridge plus 10° C.
Regrettably, according to overclocking legend Andre Yang, there is no way to bin Haswell for extreme overclocking purposes on ambient cooling. You couldn’t do it with Ivy Bridge either. That ship sailed when Sandy Bridge, well, went under the bridge and continued down the river. If you’re binning for extreme purposes (of which the esteemed Mr. Yang has binned over 500 chips as of late April), you simply have to take them cold. However, for most people’s uses, the method above to bin on air is tried and true through the hundred plus they have binned at ASUS headquarters. First check to see whether you have a chip on the upper end or the lower end of the Haswell bell curve. There will be a large variation as you can see, from the 4.3 GHz dog up to the ideal 4.8 GHz chip, both at the same voltage and temperature. Once you’ve checked on your chip, you have a general goal and can then set 1.25 V – manually, so it doesn’t overshoot like it would on Progressive voltage. After setting 1.25 V, then raise the multiplier. Etc, etc until you find your chip’s maximum ambient clock. Like all chips, you want to try to keep your chips as cool as you can to increase their longevity. Personally, I’d try to keep a Haswell chip below 85 °C for 24/7 operation (definitely below 90°C); not because they can’t take more (they can), but because it’s usually safer to err on the side of caution. Multiple people we talked to as ASUS actually said they think single stage cooling is going to make a comeback (anyone remember the Lian Li cases with SS coolers built-in?). Yes, these run hot; but if you control them, they’ll do well for you. Speaking of temperatures, surely people will be saying “Haswell has the same problem as Ivy Bridge,” referring to the thermal paste issue. Yes, Haswell has thermal paste, but from Very Authoritative People, the TIM is not the problem. As has been posited across the net when people de-lid Ivy Bridge chips with great results, it’s really the black adhesive that’s the culprit. When you cut out that adhesive, it allows the IHS to sit closer to the CPU die, meaning there is less thermal paste through which the heat has to travel, leading to significantly lower temperatures. Intel’s TIM is really quite good, but the manufacturing process leads to that glue being just a little too thick, which is why you see such temperatures. 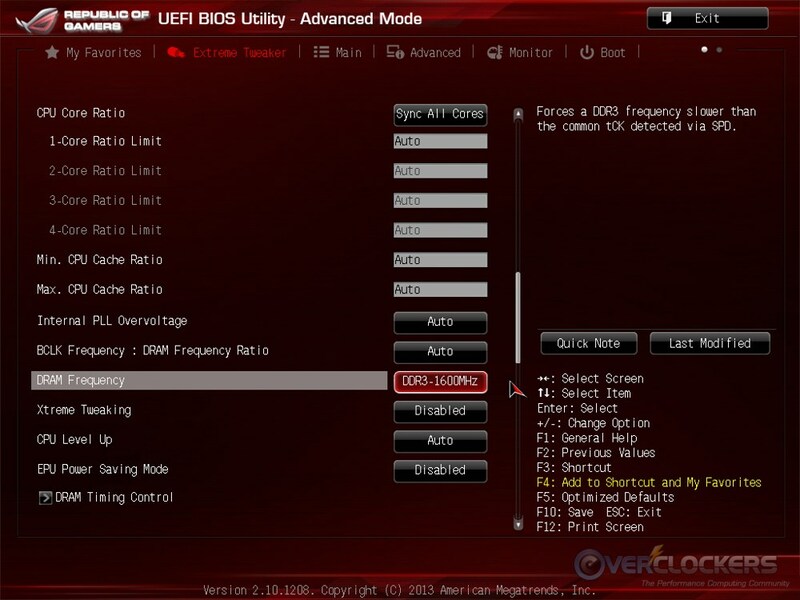 Even if you de-lid your Haswell CPU, don’t expect a 60°C chip all of a sudden. These are produced on a very small process, with billions of transistors in an extremely tiny area. Even if you have a perfect die-to-IHS interface, the chip is still going to run pretty hot because there is so little surface area off of which to pull the heat. I guess what I’m saying, to put it succinctly (too late! ), is: Don’t worry about temps, within reason. If your chip runs warm, that’s ok. They’re just going to do that. You can’t draw heat away as fast as you used to be able to when you’re dealing with such a small surface area with such a large transistor count. Keep them as cool as you can and be happy. Now that you have explored your chip for roughly its highest stable overclock, you can move on to other parts of the system. We’ll start by telling you one very important thing: RAM is a different animal than it was on Ivy Bridge. With Ivy, you could get RAM that clocked to the moon. Assuming your chip had a decent IMC (integrated memory controller), you could anticipate an easy DDR3-2133 to DDR3-2400 RAM clock. Good chips would get to DDR3-2800 and even beyond. With Haswell, that has all changed. Memory is a strange beast with Haswell. With your CPU clocked at stock, the Haswell IMC is a beast. Some chips will be able to do DDR3-3000+ without so much as batting an eye. Others not so much, but DDR3-2400 isn’t a stretch at all. 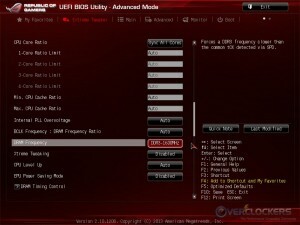 But – and this is a big, bold, italicized, very notable but – overclocking a Haswell CPU at the same time as overclocking the RAM will reduce your IMC’s ability to overclock or reduce your CPU’s ability to overclock. You have to choose one or the other, which is why the CPU came first in this guide. Core speed is king; remember that. If it comes down to choosing which to push farther, the CPU should always win in your calculations. This will not only be heavily depending on the particular CPU you get, but also on the motherboard you choose. For instance, the Intel motherboard used for the Haswell review couldn’t run greater than DDR3-2133 at 4.8 GHz. However, using the same chip and the same memory, the ASUS Maximus VI Extreme for a future review had no problem running DDR3-2600 at 4.8 GHz. Speaking of ASUS, let’s start with an example they gave. 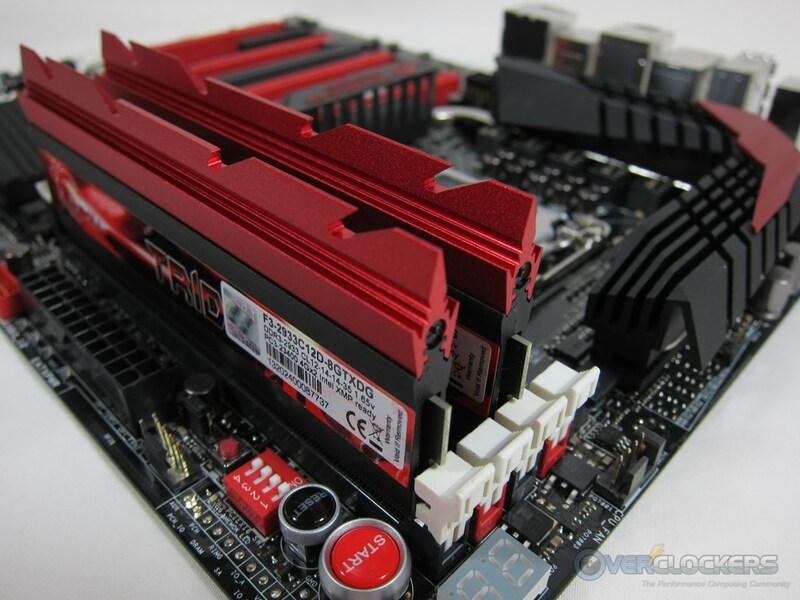 You might be able to run DDR3-2800 RAM and overclock your i7 4770K to 4.4 GHz. However, drop that down to DDR3-1600 or DDR3-1866 and that same CPU at the same voltage might be able to get to 4.6 GHz now. Everything in Haswell is linked. Reducing RAM speed on poor-to-pretty good chips will almost invariably increase the CPU’s ability to overclock. Thus, you know all these high speed kits that were selling well with Ivy Bridge? Get ready to see how tight they can tighten their timings at lower speeds. Timings are back folks. No longer can IC manufacturers count on increasing memory clock, timings be damned. If you can get your hands on an older PSC or BBSE based kit with tighter timings (the G.Skill Flare DDR3-2000, 7-9-7-24 kit of yesteryear comes to mind. *Cough* someone killed mine…*cough* IMOG *cough*…. ), it would behoove you to do so. Now that you know Haswell’s dirty little secret, you can start to work on your RAM. Memory enthusiasts will want to just see what their chip’s IMC is capable of, or, if you have a high speed memory kit, at least see that your IMC can run your RAM’s rated speed. So that’s where we’ll start. 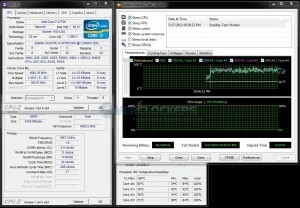 Set your CPU multiplier and voltage back to Auto and then manually set your RAM’s speed and timings. You should already have set its voltage earlier, but if you didn’t, do that now as well. One tip I will share from my testing – Setting your System Agent (VCCSA) from 1.15 to 1.25 V will help out tremendously. Using those settings I’ve successfully been stable up to DDR3-2933 so far and I’m sure it will climb. So when clocking memory, set those voltages in addition to your RAM’s voltage. Boot up into your OS and then send it through a run of HyperPi (download it here) using all available threads and the 32M setting. Warning: This will slow your system – any system – to a crawl while it completes. It’s the best memory stability test I know of other than Memtest or hardware testing. The test should take eight to ten minutes to complete. Now that you (hopefully) know your memory will run its rated speed and timings, it’s time to push on the CPU again. Set it to the 1.25 V you used earlier and your already known-good multiplier. If you are running DDR3-2000 (or less) memory, chances are you’ll set it and be good to go. If you’re running DDR3-2133 or greater, you are about to find out how good your chip is when the CPU speed is combined with higher speed memory. If the system fails to boot or is unstable when you go into the OS and test for stability, you are on the wrong end of the bell curve with regard to memory overclocking. Don’t be disheartened though, as long as your CPU is a decent overclocker, CPU clock speed is always king and you will just need to reduce your memory speed. So go back into UEFI and turn your memory to the divider immediately below the one you’re on. Go back into the OS and test for stability. Rinse and repeat until you have a stable system with your known-good CPU clock and your highest stable RAM divider. If you have had to reduce your RAM speed at this point, don’t be discouraged. With some RAM kits – not all, but many of them – you can now get back some of that lost capability by exchanging reduced speed for tightened timings. With ICs currently on the market, you would do well to reduce timings in the following order, going into the OS and running HyperPi 32M to test stability in between each change. * For our purposes, we’ll only deal with the first four memory timings (CL – tRCD – tRP – tRAS, i.e. 9-11-9-24) and the command rate. Command rate – Go from 2T to 1T (or 2N to 1N, depending on what your board calls them). This is the easiest change to make and most kits will have no problem with this change. tRP – Try reducing by one or two. This timing is relatively forgiving, but is a little more difficult than tRAS in the next step. tRAS – Try reducing by two to five. Of the four primary timings, this one is the easiest to reduce. tRCD – Try reducing by just one. It gets harder with this timing. You might not be able to reduce it at all. CL – This is the trickiest and is more difficult to tighten than tRCD. Try just one here as well, but expect you won’t be able to reduce it, depending on how far you had to reduce your memory speed. If you can reduce it, this will have the biggest impact on benchmark results. Once you have your lowest stable timings at your new memory clock, you’re done with memory for now. Not forever as you’ll see shortly, but for most people, this is where you can stop. You have successfully set very close to your most optimized CPU and memory frequencies (and timings for the latter) for your new Haswell build. Congratulations, you’re overclocked! Of course, we’re overclockers. You knew we wouldn’t just stop there. Now we get to the extra tweaking part. The part that will do very little for you in terms of practical use, but will let you fine tune your system however you want. BCLK has been an interesting beast since Sandy Bridge came out. The days of 100-200 MHz+ bus clock adjustments have been gone, at least in a totally linear fashion. Sandy Bridge and Ivy Bridge were both 100 MHz +/- 5-10%, with some rare samples getting in the ~15% range, but those were definitely the exception. Sandy Bridge-E introduced a new option for those that enjoy tweaking their systems – BCLK strap, where you could use a 100, 125 or 166 MHz BCLK strap while keeping everything else (i.e. PCIe busses, storage lanes, etc) in spec. That gave you the ability to choose where your BCLK’s starting point was, then adjust the same 5-10% up or down from there. All was not perfect with Sandy Bridge-E though, in that not all chips could even get to the second BCLK strap (they go 100/125/166 MHz) reliably. While the ones that could do 125 MHz strap weren’t too rare, the ones that made it to the 166 MHz strap were indeed the exception to the rule. Intel in its infinite wisdom has now granted the mainstream users with the BCLK strap option. Like Sandy Bridge-E, Haswell will have the same three BCLK strap options. 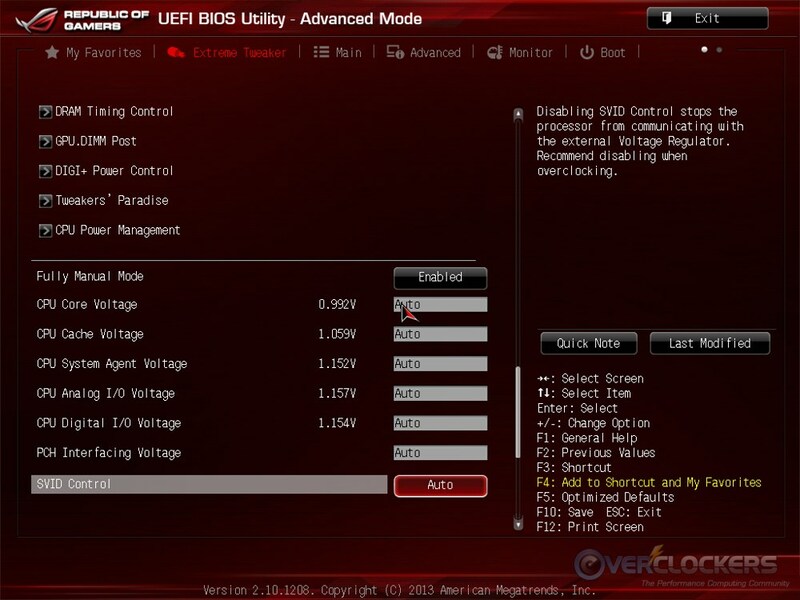 Through some “magic” (their word), ASUS has actually gotten a 200 MHz BCLK strap option into their Maximus VI Extreme UEFI and it is indeed usable on chips capable of reaching it. Obviously that is a 20%+ increase over the 166 MHz strap, which is pretty sweet. They would not tell us what they did to get there, simply referring to it as their magic. For obvious reasons (they don’t want everyone doing what they’re doing), they’re reluctant to share how they managed that publicly. Anyway, the great news about Haswell is that – unlike their SNB-E cousins – most, if not all, CPUs can reach the 166 MHz strap without issue. That gives you a lot more flexibility to tune your RAM and CPU to achieve their absolute maximum stable frequencies. There are far too many variables to go into every single scenario of course, but a couple examples should suffice. As you can see, this gives you a significant amount of room to toy with. In addition to simply changing the BCLK strap, remember you also have 5-10% (sometimes more) worth of BCLK wiggle room. Say your chip isn’t quite a 4.7 GHz chip, but will do just a hair under it with acceptable temperatures and stability. NO problem! You can shoot for 4680 MHz from any one of those straps. Notice in the examples, the last one went down instead of up. BCLK is + OR – 5-10%. Say your RAM can’t handle one of the dividers at that particular BCLK but you want to use that particular strap, simply raise your CPU multiplier by one and lower BCLK as necessary. There are myriad possibilities with this sort of configuration. With the new BCLK strap option, you can dial in your system exactly where you want. It’s not FSB clocking of old, but it’s a lot better than the locked-down 100 MHz +/- 5-10% of Sandy Bridge and Ivy Bridge. When you consider what FSB overclocking of yesteryear was like, this can be considered an improvement. You can select any RAM you want without worrying about clocking it too far (you could never go under a 1:1 ratio and RAM became a very limiting factor on, say, an E8400 at 550+ MHz. You also don’t have to worry about extra cooling needs of pushing a northbridge very far (I had one that burned an impression into a water block). Some of these tips will repeat items mentioned earlier, others will be new but weren’t all-encompassing like the rest of the guide and will be very chip-specific. The number one most helpful tip to make sure you’re getting the most out of your CPU is to reduce the memory speed and try overclocking again. If you followed the guide, you shouldn’t have set your memory to a fast speed to begin with, but some people – myself included – for years have always gone into BIOS and the first thing they did was set memory speed, timings and voltage. It’s so familiar, the action is darn near muscle memory by now. If you did that and have high speed memory (> DDR3-1600 or DDR3-1866), try reducing memory speed and see if that helps your CPU get any further. If you just set the voltage and left everything else alone, you can skip this step. Next up a short list of quick tips & tricks to get that last MHz out of your CPU. If you manually set it, always keep the Cache/ Ring Bus / Uncore Frequency within 100-300 MHz of your CPU Core speed. There are two new PLL Options – SBPLL and LCPLL. Pay attention to both the package temperature and the core temperatures. The integrated voltage controller has a big influence on temperatures. Always keep temperatures as low as you can. This list is not totally exhaustive. We’re happy to revise new tips and tricks in here, so if you find out some great items to overclock your CPU, don’t hesitate to share them! How to test for stability has been a very long and drawn out debate. Some people use Prime95, others IntelBurnTest, still others OCCT. I’m here to tell you whatever you want to do is fine, as long as you know their pluses and minuses. For instance, Prime95 only tests the one instruction set on your CPU but not all at once (SSE, AVX, FPU, etc). It’s good for heating up your CPU, absolutely, but it doesn’t necessarily throw the kitchen sink at it. 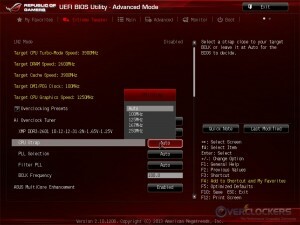 From the first 3770K and even at present, ASUS advocates using AIDA64’s stability test. The software is free (shareware, with just a couple features blocked; licenses are cheap if you find you need everything) and easy to use. The reason they advocate AIDA64 – with which I agree – is because it tests all instructions at once. It throws everything plus the kitchen sink at your CPU. It’s fast, stable and will also heat up your CPU. Thus, here is my tools list for testing stability. CPUz for frequency and voltage monitoring. Super important note: These programs will increase temperatures further than any other program you’ll ever use in day to day PC operations, even Folding@Home. So be sure to watch your temperatures. If you are seeing frequency and voltage throttling because your CPU is north of 95°C (or worse, north of 100°C), you need to dial it back. Even if your chip can clock that far, it’s not good to operate at the temperature of boiling water for prolonged periods. How long you run for stability testing is totally up to you. After doing this for years, I tend to take the easy route – 10 minutes to an hour of stability testing, then cease that nonsense and use the computer for a week or so. If you want to immediately jump into mission critical work (i.e. writing word documents / editing spreadsheets you can’t lose, programming, etc…anything that you don’t want to potentially crash on you), you might want to do it longer than I. Rational people I know suggest 24 hours of stability testing before they’ll deem their overclocks stable. There are good arguments for doing it that long. Just watch your temperatures and make sure you’re not throttling. 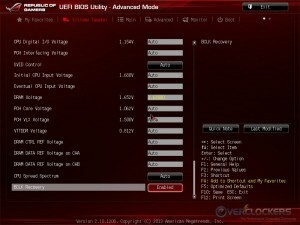 Now that you have your CPU dialed in, let’s talk about the way you apply voltage to it. So far we’ve only spoken about manually setting voltage and for the purposes of finding your maximum stable overclock, that’s fine and dandy. However, when your CPU isn’t under load, you don’t necessarily want it running at its max stable overclock with a constant voltage applied. So while we’ve covered manual voltage settings, there are two other options that might serve you better. Offset voltages do just what you think it does – offsets the voltage +/- the amount you set. 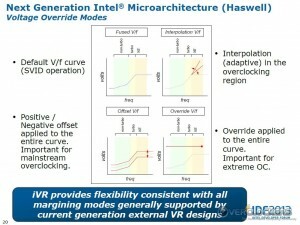 It takes the standard Intel voltage curve and just raises the whole darn thing, top to bottom. While this is better on your CPU than just a manually applied, constant voltage -and it used to be the best option for not running manual voltage- it’s not the best option any more. Adaptive voltage is a lot smarter than your average offset voltage. What it does is raise the part of the voltage curve that you need under load, but leaves the lower end of the curve (when the CPU is operating at 800 MHz) alone. Thus, the higher voltage you need is there when the CPU calls for it, but you have no increase in idle voltage at all. This is going to be the best choice for letting your CPU breathe, as it were, when idle. You set the maximum voltage you want the CPU to get and go on your merry way knowing the CPU can draw the voltage it needs when it needs it. A picture is worth a thousand words, and this slide outlines the voltage override modes quite well. Caveat – big, massive, honking, pay attention to this – caveat! When using adaptive voltage, the top of the curve isn’t necessarily the whole story. ASUS drove this point home when we met and I’m doing so now; we all need to do this as a public service to our users and readers. Even though you set 1.25 V as your maximum voltage, under certain very heavy loading conditions (i.e. stress testing), the voltage can and will exceed the maximum you have set. Let me say that again – if you stress test using adaptive voltage, even with the maximum set to 1.25 V, the CPU will – guaranteed – request and receive more voltage than you have told the motherboard to deliver it. It’s just the way this works. In the ASUS demonstrations, setting a maximum 1.25 V in this scenario and then running something like AIDA64, Prime95, etc – any stress testing application designed to stress more than normal loads – the CPU requests and gets ~1.36 V. There is nothing you can do about this and it will happen whether you want it to or not. The only way to prevent stress testing programs from pulling extra voltage is to use a manually set voltage, which takes away your CPU’s ability to reduce voltage when idle. All is not lost though! You probably noticed every time I told you what would happen it went hand in hand with stress testing. That’s because those are the only scenarios that will lead to this behavior. 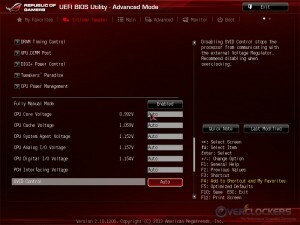 In all other circumstances so far as ASUS can tell, the CPU will cap at the set 1.25 V and never exceed it. Even if you’re Folding@Home it should maintain the 1.25 V cap (though those folding at home are under 100% load all the time and I’d suggest using a manual voltage for those machines just in case). Likewise, video encoding, audio encoding, compression, rendering – any CPU-intensive process, your CPU will maintain the 1.25 V cap. So, now that you know the very important caveat, set 1.25 V as your maximum voltage with adaptive voltage, enable C1E and EIST (which throttle your multiplier and voltage when not under load) and go on with your merry life knowing your CPU is as relaxed as it can get when idle. I haven’t really had time to freeze one of these chips yet, but thanks to being able to speak with Andre Yang, we have at least two important notes to share. First off: CB & CBB (cold bug & cold boot bug) are back. In his testing, you’re looking at a CB/CBB of ~ -120 to -130 °C for the worse chips (think the 4.3 GHz dogs) and ~ -130 to -140 °C for the better chips. Thus, if you don’t have a well controlled pot with plenty of mass, it’s time to look for one. Second tip – give them all the voltage you can with (relative) impunity. That 7 GHz validation you saw floating around before launch with 2.5 V+ applied to the CPU? That’s no bug folks. Earlier ES chips could indeed have 2.5 V applied. There is a lower cap for retail chips; you can’t take them to extra-insane levels like that, but you should still be able to get in the ~1.9 V range similar to Ivy Bridge chips today. Oh, and the 2.5 V+ chip? I’m told it’s still alive and happy. That could very well be the exception to the rule, so don’t think you can apply near two volts to a chip and have them necessarily live to tell the tale. Lastly, what are you shooting for? After ~500 chips, Andre’s best chip was around 7.3 GHz. It’s OK if you get a less-than-perfect chip though, because a 6.5-6.7 GHz Haswell chip is roughly equivalent to a 6.9-7.1 GHz Ivy Bridge chip. Until we get to play with these under sub-zero conditions, that’s all we’ve got for the extreme crowd. That’s OK though, because this is a guide geared toward less extreme overclockers anyway. If you’ve made it to this point, congratulations, you’ve done it! Your new Haswell platform is overclocked and tuned to its best, most efficient overclock. If you followed that last section and use adaptive voltage, it is even taking advantage of the power sipping idle states. All that’s left now is to show everyone else what you’ve done! 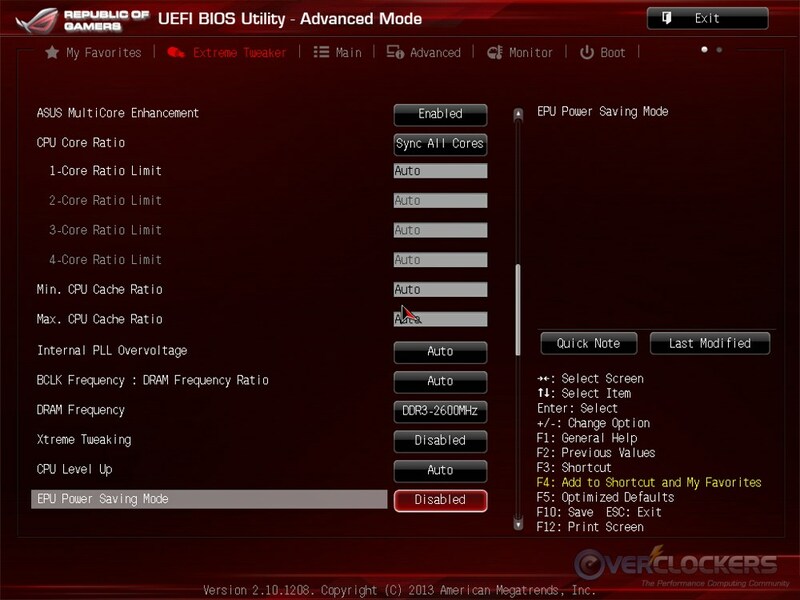 Comment on this thread with a screenshot of your overclock and fill out one of the forms in the first two posts (for the i7 4770K and i5 4570K, respectively). We’d love to know what you were able to do with your CPU. With your help, we can plot our own results and see just what a crowd-sourced Haswell CPU bell curve looks like. The only request is that you post stable overclocks. If you want to post your “ZOMG LOOK WHAT FREQUENCY I VALIDATED!” result, we’d love to see that too, but over in the benchmarking section. For the purposes of our – and I use this term loosely – research, let us know what overclock you achieved with stability. I’ll reserve the first post for you to post your results. Please submit via the embedded Google form and it will automatically add your result to the database and over time it will allow us to graph the results so we can see what sort of average there is as well as whether there is any correlation with batch numbers. Please feel free to also submit a screenshot of your overclock so we can make sure some joker isn’t just filling out the form with bad data. Did you use/like adaptive voltage? Why / why not? Nice guide, can't wait to put it to use! @Hokie, I found that observation of yours about the inverse relationship between CPU clocks and ram clocks to be specially interesting. In that case, all of the really impressive Haswell ram clocks being posted about are pretty much for show, because if you want overall higher performance (like you stated, CPU clocks are what counts), then you aren't likely to be running one of those 2933 kits at their rated clock speed. Granted, there is nothing wrong with showing off the ram at 3000+, but from a practical standpoint that makes absolutely no sense if you have to dial down the CPU to accomplish it. One this is dropping it down a notch if you're right at the edge, but this appears to be way more than that. Have you had the opportunity to discuss this with Asus or anyone else to confirm that this has been observed by others, or is it possible that it is peculiar to your sample? Well, the pifast record is at 6700mhz and uses bbse over 3000mhz with cl5-9-7-18-1t...so I'm not too sure about that. @Janus67...sir, in this case, your glowing praise of the ram is simply not sufficient. Dang, those are some serious sticks of ram! @ivanlabrie, that may very well be true, but Hokie's testing was done at ambient temps so comparisons should probably be as well in order for them to be relevant. You now that what happens at sub-ambient temps doesn't always hold true at ambient temps, much less 24/7 usage. Excellent question Reefa. My RAM advice actually come a straight from ASUS. I used it to my advantage when clocking my chip but that is expected to be the new norm. Obviously YMMV with IMC and CPU clocks, and going cold as you've seen on the not throws convention out the window. The guide is for ambient clocking mostly though. 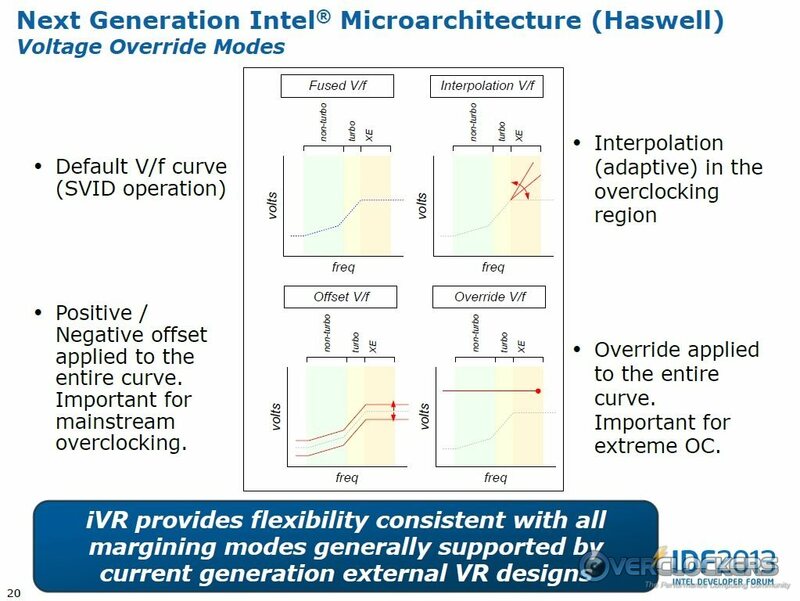 I'm going to be disappointed if Haswell's IMC doesn't run memory overclocks at half bank or even full bank "stable" with higher memory speeds than IB will run in the x44 to x48 range. I picked up a new combo this morning... So we will see how it goes. @hokie, thanks for the reply. These chips do seem to run rather toasty... Initial quick (~30 min) Prime large fft at 45x with fixed vcore @1.2v. EDIT - OMG mdcomp fail. Stand by for form insertion! ***A separate thread for results was created. These are the same forms and will still work, but to see the graphed results, check out the Intel Haswell i7 4770K & i5 4670K Results Thread!